Pomella has been extensively studied and shown to support a number of health biomakers related to anti-aging, skin health, and overall health, as well as offering antioxidant and systemic health benefits*. A multitude of publications have been completed on the beneficial effects of pomegranate. Pomegranate’s polyphenols have been shown to impact key biomarkers during recovery after exposure to UVA and UVB rays, supporting its applications in skin health and anti-aging* (Pacheco-Palencia LA et al and others). Pomella® is a pomegranate extract developed to deliver high amounts of pomegranate polyphenols and ellagitannins, the major of which is punicalagin. Punicalagins and their metabolites, namely urolithins, deliver an array of benefits associated with health and wellbeing*. Pomegranate is a well-studied, scientifically-tested antioxidant and is known to exhibit health benefits in areas of skin health, antioxidant support, and healthy aging*. Pomegranate’s benefits are wide-ranging and have been studied to impact several areas of overall health and well-being*. 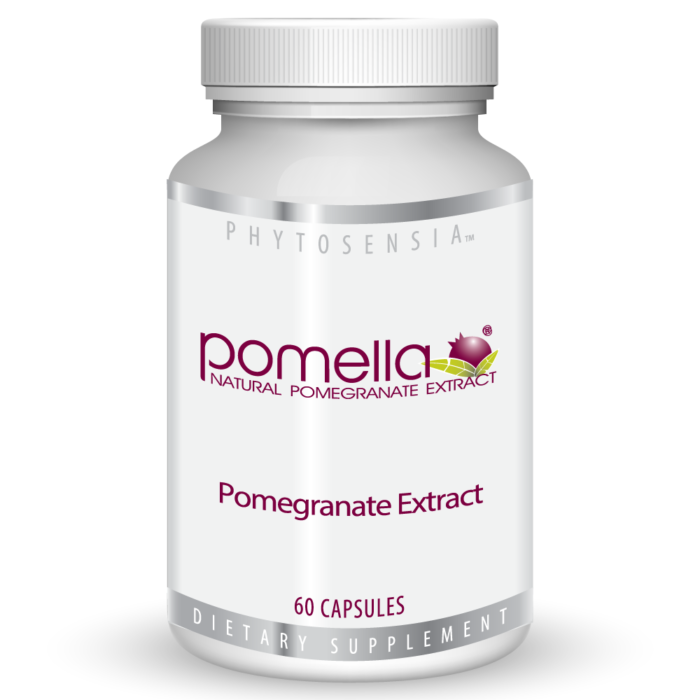 Pomella® utilizes a patented (US Patents 7638640, 7897791, 7919636, EP Patent 1734949) approach allowing absorption to harness the associated benefits of ellagitannins*. 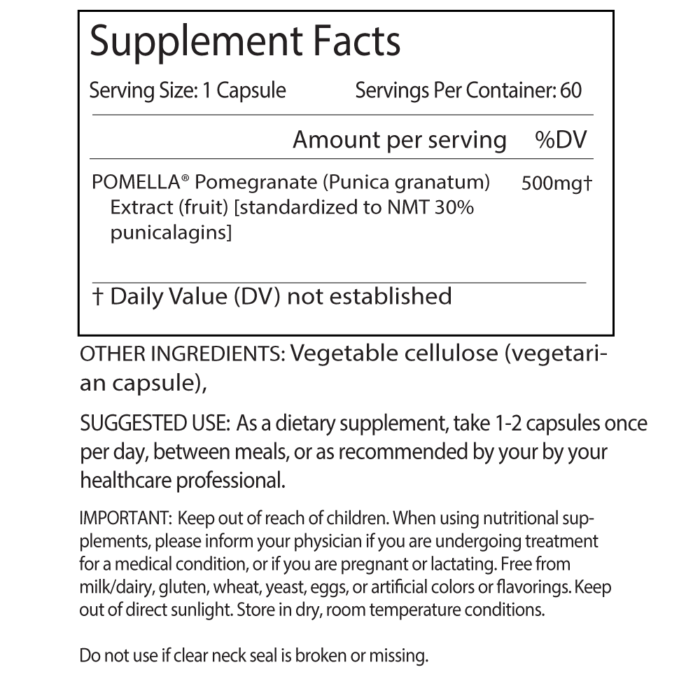 After years of continued research, Pomella® stands as a premier ingredient*. Pomella has been extensively studied and shown to support a number of health biomarkers related to anti-aging, skin health, and overall health, as well as and offering antioxidant and systemic health supporting benefits*. A multitude of publications have been completed on the beneficial effects of pomegranate. Pomegranate’s polyphenols have been shown to impact key biomarkers during recovery after exposure to UVA and UVB rays, supporting its applications in skin health and anti-aging* (Pacheco-Palencia LA et al and others).